Soho Rezanejad is an electronic composer and vocalist whose practice, much like her upbringing, is a testament to versatility. Born in 1989 in New York City, the child of relocated Iranian dissidents, Rezanejad was raised in Copenhagen, Denmark, where she currently studies at the Rhythmic Music Conservatory. The tongues, scales, and registers in which she sings have varied through each of her releases; this same unwavering commitment to change is also found across the diverse themes and instrumental palettes Rezanejad has explored in her recent sonic works. 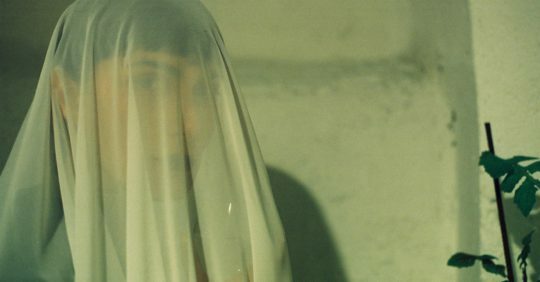 In 2015, Rezanejad founded Silicone Records, the label through which her solo projects have been released. Her first EP, Idolatry, is a collection of nocturnal meditations in the form of pop songs. In the next years, Rezanejad shifted into more abstract and abrasive structures with three releases under the now-retired Angeles moniker. Six Archetypes was released in early 2018, playing out through its 14 tracks an extensive search into humanity’s mythic postures, making use of timbres ranging from the orchestral to the android. Rezanejad’s most recent EP, World Breathes People, is comprised of two long-form compositions centered on sustained tones, broken by synth notes, textures of digital grit, silence, even fricative contact against the mic. Listening to her full catalogue, what defines Rezanejad’s sonic practice most essentially is a resistance to definition.